Built: Between 1548 and 1560. Ownership / Access: Used for receptions and meetings by the Belgian Ministry of Foreign Affairs. Notes: The Egmont Palace (Dutch: Egmontpaleis, French: Palais d'Egmont) is a large mansion at the Rue aux Laines (Wolstraat) and the Petit Sablon Square in Brussels, Belgium. Today it houses the Belgian Ministry of Foreign Affairs. 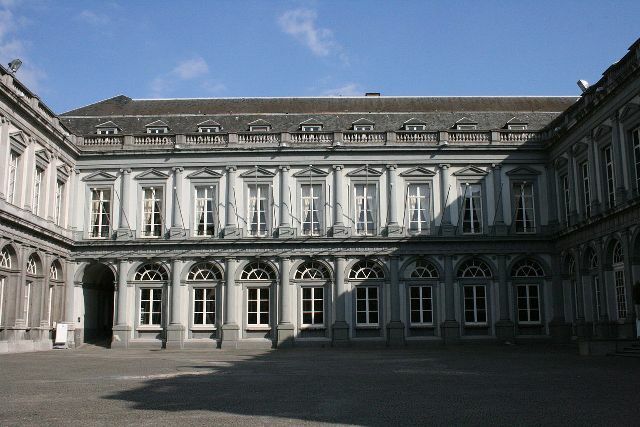 Egmont Palace is situated at an elevation of 69 meters. It was built between 1548 and 1560 by Françoise of Luxembourg and her son, Lamoral, Count of Egmont, first in Flemish Gothic style, later Renaissance. The fabric was dramatically transformed in the 18th century, when the building was clothed in Neoclassical style, while the property passed onto the Arenberg family. The plans for this stage are attributed to the early advocate of neoclassicism, Giovanni Niccolò Servandoni. After a fire demolished the oldest part of the building in 1891, it was reconstructed in a uniform neoclassical style. The venue hosted the fencing events for the 1920 Summer Olympics in the garden. After World War I, the owner, the German Arenberg family, was forced to sell the building to the city of Brussels. In 1964 it was sold to the Belgian state. In 1977, the Egmont pact on the Belgian state reform was signed in the Egmont Palace during the second administration of Leo Tindemans. Today, it is being used for receptions and meetings by the Belgian Ministry of Foreign Affairs.